Cell death and inflammation are key pathologic responses of acute pancreatitis (AP), the leading cause of hospital admissions for gastrointestinal disorders. It is becoming increasingly clear that damage-associated molecular pattern molecules (DAMPs) play an important role in the pathogenesis of AP by linking local tissue damage to systemic inflammation syndrome. Endogenous DAMPs released from dead, dying or injured cells initiate and extend sterile inflammation via specific pattern recognition receptors. Inhibition of the release and activity of DAMPs (for example, high mobility group box 1, DNA, histones and adenosine triphosphate) provides significant protection against experimental AP. Moreover, increased serum levels of DAMPs in patients with AP correlate with disease severity. These findings provide novel insight into the mechanism, diagnosis and management of AP. DAMPs might be an attractive therapeutic target in AP. Acute pancreatitis (AP) is inflammation of the pancreas that can become a fatal disease or lead to severe complications (1). It is characterized clinically by abdominal pain and by increased pancreatic enzyme levels in the blood or urine. Gallstone migration and alcohol abuse are the two major risk factors for AP in humans (2,3). According to the updated Atlanta classification, AP is generally divided into mild, moderate or severe pancreatitis according to the presence or absence of multiple organ failure (MOF) or local or systemic complications (4). Mild pancreatitis has a good prognosis with rapid recovery. The late consequences of AP include impaired pancreatic exocrine function and glucose tolerance, diabetes and development of chronic pancreatitis (5). Moderately severe AP is characterized by the presence of transient organ failure, local complications or exacerbation of comorbid disease (4). About one-third of patients with AP develop severe necrotizing pancreatitis with persistent MOF and a high mortality rate. The main goals in the clinical management of AP are adequate fluid resuscitation and the prevention of MOF (6,7). Both genetic and environmental factors affect the development and severity of pancreatitis (8). Although the pathogenic mechanisms remain largely unknown, increasing evidence suggests that damage-associated molecular pattern molecules (DAMPs) play a central role in the pathogenesis of AP. DAMPs link local tissue damage to systemic inflammation response syndrome (SIRS), which, if severe or sustained, can lead to subsequent MOF and even death (9,11) (Figure 1). Most DAMPs are recognized by membrane-bound and cytosolic pattern recognition receptors (PRRs) expressed by both immune and nonimmune cell types. This triggers downstream signaling and manifests as sterile inflammation (9,12,14). In this review, we outline the pathogenesis of AP, discuss the relationship between cell death and AP, and highlight the latest exciting advances in the pathogenic role of DAMPs in AP. 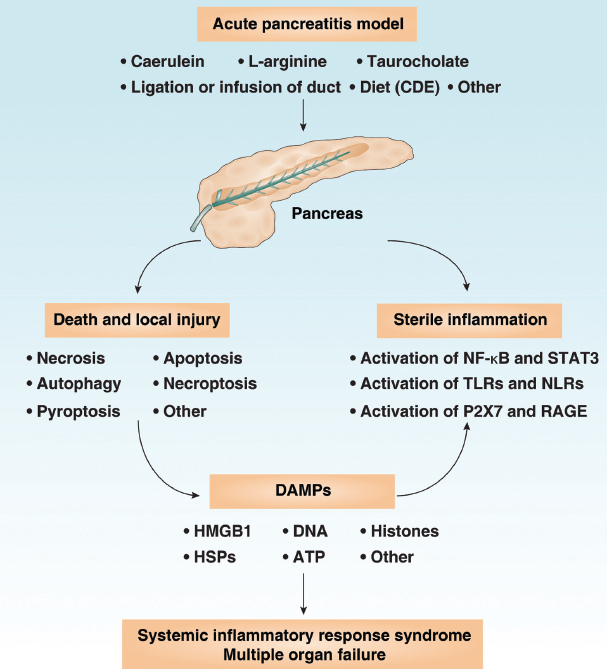 Emerging role of DAMPs in acute pancreatitis. A number of rodent models have proven useful for studying the pathogenic mechanisms of acute pancreatitis. 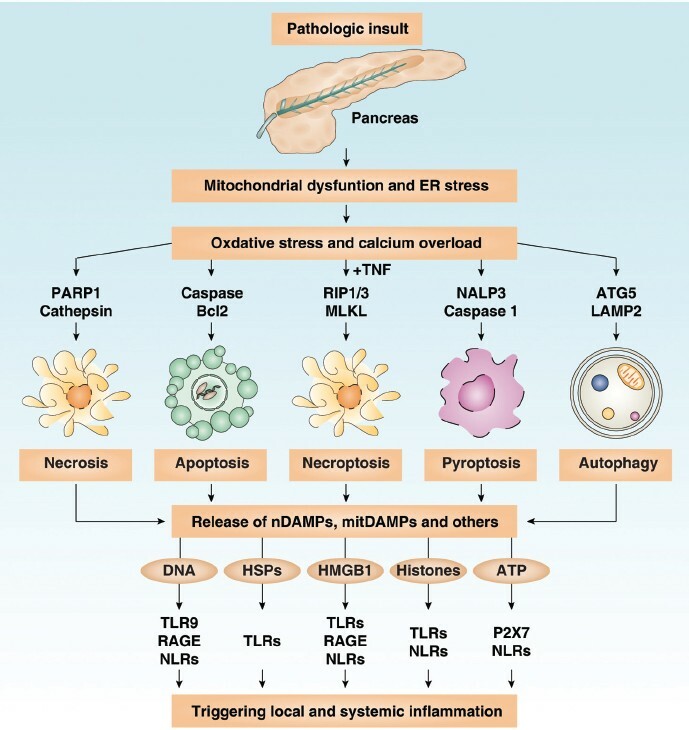 Increasing evidence indicates that DAMPs such as HMGB1, DNA, HSPs, histones and ATP play a central role in the pathogenesis of acute pancreatitis because DAMPs link local tissue damage and death to systemic inflammation response syndrome, which leads to subsequent MOF and even death. The pancreas is a dual-purpose gland with exocrine and endocrine functions. The exocrine pancreas produces digestive proteases in inactive proenzyme form, namely zymogens. The pancreas is normally able to protect itself from zymogen activation by synthesis of protease inhibitors such as pancreatic secretory trypsin inhibitor and serine protease inhibitor (for example, SPINK1/Spink3). By contrast, pancreatic autodigestion and subsequent AP is initiated once these defenses are impaired. In studies of rodent models (for example, repetitive cerulein or L-arginine injections, choline-deficient ethionine supplementation [CDE] diet, perfusion of taurocholate into the biliary or pancreatic duct and surgical ligation or infusion of pancreatic duct models), some essential pathogenic AP events have been identified (see Figure 1) (15,16). The development of AP involves a complex cascade of events (17), which start with injury or disruption of the pancreatic acini, which then permits the leakage of active pancreatic enzymes including amylolytic, lipolytic and proteolytic enzymes that destroy local tissues. This results in edema, vascular damage, hemorrhage and cell death (18,19). In addition to oxidative stress (20) and calcium overload (21), hypotension (22) and low acinar pH (23) contribute to these initiation processes. After initial production of active pancreatic enzymes, local cell death and systemic inflammation ensue. Mitochondria, the energy factories of cells, regulate pancreatic cell death through control of the production of adenosine triphosphate (ATP) and reactive oxygen species (ROS), as well as calcium (24). Dysfunction of mitochondrial calcium uptake and efflux, including elevation of cytosolic calcium from the endoplasmic reticulum, can cause mitochondrial calcium overload, which leads to enhanced generation of mitochondrial ROS and mitochondrial membrane permeabilization. Mitochondria dysfunction-mediated oxidative injury results in endoplasmic reticulum stress, lysosomal damage and the release of proteases (for example, cathepsin and trypsin) to degrade cytosolic proteins that cause pancreatic acinar cell death (25,26). Dead, dying and injured pancreatic acinar cells release intracellular contents, including DAMPs (for example, high mobility group box 1 [HMGB1], DNA, histones and ATP), which in turn promote infiltration of various immune cells (for example, neutrophils, monocytes and macrophages) and activation of inflammatory signaling pathways (for example, nuclear factor-κB [NF-κB], mitogen-activated protein kinase [MAPK], signal transducer and activator of transcription 3 [STAT3] and inflammasome). Of these, NF-κB appears to the main inflammatory pathway in pancreatitis, although conflicting reports have been published (27, 28, 29, 30). Recruitment and activated innate immune cells at the site of injury lead to further acinar cell injury and increase the levels of circulating DAMPs. It is important to note that neutrophil depletion markedly reduces tissue damage severity in AP, suggesting a critical role for tissue infiltration of neutrophils in AP (31). DAMPs ultimately are the mediators of the systemic inflammatory response and cause further pancreatic damage, as well as MOF. In particular, acute lung injury and adult respiratory distress syndrome are the leading causes of death in patients with AP (6). More recently, myeloid NF-κB activation was found to contribute to IL-6 synthesis and IL-6 transsignaling, which promotes pancreatitis-associated lung injury and lethality (32). A better understanding of the relationship between local tissue injury and systemic inflammation syndrome in the development of AP may provide more targeted therapeutic options (see Figure 1). The severity of experimental AP correlates with the extent and type of cell injury and death. Although multiple forms of cell death exist in physiological and pathological conditions (33), necrosis and apoptosis are the most widely studied types in both clinical and experimental AP (34,35). Necrotic cells are capable of activating proinflammatory and immunostimulatory responses by releasing DAMPs and other molecules, whereas apoptosis is usually considered immunologically silent because the cytoplasmic content is packaged in apoptotic bodies and these membrane-bound cell fragments are rapidly taken up and degraded by phagocytes or autophagy (36). However, excessive apoptotic cells can activate the inflammatory and immune responses by releasing nuclear DAMPs (nDAMPs) and mitochondrial DAMPs (mitDAMPs) (10,37, 38, 39). In addition to necrosis and apoptosis, additional pathways (for example, necroptosis, pyroptosis and autophagy) regulate DAMP release and affect AP progression (Figure 2). Collectively, these findings contribute greatly to our understanding of the immunologic choices made during cell death (12,14). The roles of different types of cell death in AP are discussed below. Release and activity of DAMPs in acute pancreatitis. Various pathologic insults cause mitochondrial dysfunction and endoplasmic reticulum stress in pancreatic acinar cells, which leads to activation of multiple pathologic signals such as oxidative stress and calcium overload. These signals are common triggers of cell death (for example, necrosis, apoptosis, necroptosis, pyroptosis and autophagic cell death) through different regulator or effector proteins as indicated. In contrast to the intracellular physiological role of DAMPs, extracellular DAMPs from cell death are important mediators of local and systemic inflammatory responses through different receptors (for example, TLRs, NLRs, RAGE and P2X7). Necrosis is a process of cell self-destruction from external or internal stimuli, whereas autolysis is caused by cell self-digestion from its own enzymes (40). Morphological features of necrotic cells include swelling of the cell, cell membrane rupture and the release of intracellular contents, including proteins and nonproteins (for example, DNA and RNA). Nuclear morphological changes resulting from breakdown of DNA show three types: pyknosis (nucleus shrinks and the chromatin condenses into a solid basophilic mass), karyorrhexis (nucleus shrinks further) and karyolysis (DNA is completely digested and none of the nucleus is visible). Karyolysis usually is observed in necrosis, whereas pyknosis and karyorrhexis occur in apoptotic cells. A number of observations have indicated that necrosis is the major type of pancreatic acinar cell death (34,41). Although some data clearly implicates that the release of DAMPs from necrosis is responsible for the inflammatory response, much less is known about the signaling mechanisms responsible for this function. A good example of such a mechanism is derived from the study of poly (ADP-ribose) polymerase (PARP) in necrosis. PARP-1 activation during DNA damage induces energy failure by depleting NAD+; the cell consumes ATP to replete the NAD+ level, ultimately resulting in energy failure and DAMP release in necrosis (42). Genetic or pharmacologic blockade of PARP inhibits necrosis and demonstrates a reduced pancreatitis response (43). In addition to the passive ATP depletion-mediated mechanisms, several active mechanisms (for example, oxidative stress, calcium overload, mitochondrial permeability transition pore opening and cathepsin release) also participate in the regulation of the necrotic process in AP (34,44,45). The actual mechanisms of necrosis involved in the development of sequential cellular and organ response in AP need further investigation. Apoptosis is a process of programmed cell death that generally includes a cell death receptor-dependent (extrinsic) pathway and a mitochondria-dependent (intrinsic) pathway (46). Morphological features of apoptotic cells include cell shrinkage, membrane blebbing, chromatin condensing, DNA fragmentation and apoptotic body formation. The caspases are central initiators and effectors of apoptosis, although the existence of a caspase-independent pathway promotes apoptosis (47). Caspase-8 mediates the cell death receptor-dependent pathway, whereas caspase-9 triggers the mitochondria-dependent apoptotic pathway. Both caspase-8 and -9 can activate caspase-3 to cleave specific groups of substrate proteins to induce apoptosis. The Bcl-2 family is divided into antiapoptosis (for example, Bcl-2, Bcl-XL, Bcl-w and MCL-1) and proapoptosis (for example, Bax, Bak, Box, Bad, Bim, Bid, PUMA and NOXA) proteins that are majorly responsible for regulating the intrinsic pathway by controlling mitochondrial outer-membrane permeabilization (MOMP) (48). When MOMP occurs, several mitochondrial proteins (for example, cytochrome c and second mitochondria-derived activator of caspases [Smac/DIABLO]) are released into the cytosol to induce the formation of apoptosome (49,50). Cerulein, l-arginine, ethanol, lipopolysaccharide (LPS), platelet-activating factor, and cytokines (for example, tumor necrosis factor [TNF]-α and interleukin [IL]-1β) have been shown to induce apoptosis in AP. Besides caspase and Bcl-2 family proteins, other components of the death machinery (for example, X-linked inhibitor of apoptosis and p53) are involved in the regulation of extrinsic or intrinsic apoptosis in AP. Given that apoptosis generally limits the inflammatory cascade, the apoptosis level of acinar cells is inversely related to AP severity (35,51). Thus, induction of apoptosis in pancreatic acinar cells exerts a protective effect (52,53), whereas suppression of apoptosis by caspase inhibitors increases the severity of AP (54). Caspases not only mediate apoptosis but also protect cells against necrosis by cleavage and inactivation of PARP or trypsin (55). Perhaps paradoxically, intracellular heat shock proteins (HSPs) protect pancreatic acinar cells partly by inhibition of apoptosis (56,57), suggesting a pathogenic role of apoptosis in AP (58). Subsequently, researchers also observed that pancreatic acinar cells undergoing apoptosis can release histones, DNA and HMGB1, which facilitate pancreatic injury and the inflammatory response (10,11). Whether induction or inhibition of apoptosis would be beneficial in a clinical setting remains unproven. In addition, the current pharmacologic agents that target apoptosis largely lack specificity. Autophagy, an evolutionarily conserved process, can deliver endogenous cytoplasmic constituents (for example, damaged organelles and unused proteins) and exogenous pathogens to lysosomes for degradation (59). Autophagy has three different forms: microautophagy, chaperone-mediated autophagy and macroautophagy. Macroautophagy (hereafter called autophagy) is the well-studied dynamic membrane process that is regulated by the family of autophagy-related proteins (ATGs). The major morphological features of autophagy involve the formation and maturation of autophagic vacuoles, including phagophores, autophagosomes and autolysosomes. Hydrolases (cathepsins L and B) from lysosomes contribute to the degradation of substrates in the autolysosome, which produce amino acids and ATP for protein synthesis and energy metabolism. Autophagy generally exerts a prosurvival function during stress, whereas excessive autophagy may contribute to cell death and DAMP release (60,61). DAMP-induced autophagy is involved in the regulation of inflammation and the immune response (14,62,63), while autophagy participates in the secretion, release and degradation of DAMPs in a context-dependent manner (64). Autophagy dysfunction has been implicated in the pathogenesis of human diseases, including AP (65,66). One early feature of AP is the accumulation of large autophagic vacuoles in pancreatic acinar cells (67,68). Autophagic flux is impaired in AP, which mediates acinar cell vacuole formation, trypsinogen activation, cell death and the inflammatory response (for example, inflammasome activation) (67,69,70), suggesting a protective role of autophagy in AP. In contrast to the above concept, ATG5-mediated autophagosome formation in acinar cells is not blocked in pancreatitis, and inhibition of autophagy from ATG5-deficient mice improves cerulein-induced AP with reduced trypsinogen activation, suggesting that autophagy is a harmful response (67,68). 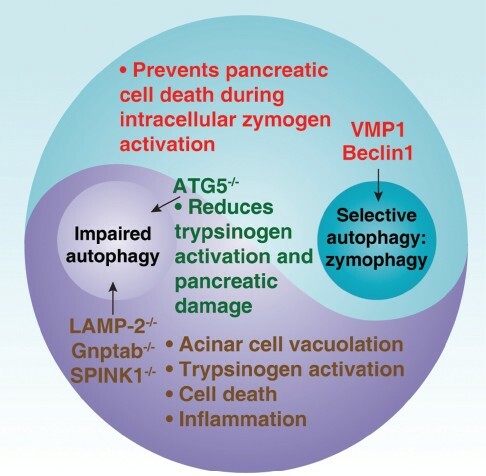 Perhaps more importantly, the expression of vacuole membrane protein 1 (VMP1) is increased in AP and mediates “zymophagy,” a selectively autophagic pathway to remove zymogen granules, and prevents pancreatic acinar cell death by interaction with Beclin1, an essential regulator of autophagy and apoptosis (71, 72, 73, 74). Mitochondrial injury and lipid abnormalities have been associated with pancreatitis (66). The functional interaction of zymophagy and other selective autophagic pathways including mitophagy and lipophagy in AP have been insufficiently explored. Lysosomes can be involved in various cellular transport processes, including autophagy. Lysosomal dysfunction from deficiency of Gnptab enzyme and lysosomal membrane protein (LAMP)-2 can lead to autophagic flux impairment in AP (67,69,70). Loss of LAMP-2 impairs autophagosome-lysosome fusion and promotes necrosis and inflammation, which is associated with HMGB1 release in AP (70). Interestingly, autophagosomes are increased significantly in trypsin inhibitor SPINK1/Spink3-deficient pancreatic acinar cells (75). However, it is unclear how SPINK1 regulates autophagy flux and zymophagy. Collectively, these studies suggest that autophagy has both positive and negative impacts on pancreatitis (Figure 3). The yin and yang of autophagy in acute pancreatitis. On one hand, VMP1-Beclin1 complex-mediated zymophagy, a selective autophagy, prevents pancreatic acinar cell death through degradation of zymogen. On the other hand, deficiency of LAMP2, Gnptab and SPINK1 cause impaired autophagy flux and increased autophagosome accumulation, which mediates vacuole formation in pancreatic acinar cells, intracellular activation of trypsinogen, cell death and the inflammatory response. By contrast, deficiency of ATG5 decreases autophagosome formation, which reduces intracellular activation of trypsinogen and pancreatic damage in AP. Thus, autophagy plays a dual role in the regulation of AP. Necroptosis is a process of programmed necrotic cell death (76). Morphological features of necroptosis are similar to that of necrosis and various types of autophagic vesicles are frequently observed (76). Stimulation of death receptors upon ligation by TNF-α, FasL and TNF-related apoptosis-inducing ligand (TRAIL) under apoptosis-deficient conditions, in particular with pan-caspase inhibitor Z-VAD-FMK or inhibition of caspase-8, may induce necroptosis. Receptor-interacting protein (RIP) kinases play a central role in the regulation of necroptosis. The RIP kinases contain seven members that facilitate NF-κB activation and death-inducing processes. As caspase-8 substrates, binding of RIP1/RIPK-1 to RIP3/RIPK-3 forms a phosphorylation complex to assemble the necrosome (77). Cellular FLICE inhibitory protein (cFLIP) is a homolog of caspase-8. In the presence of the long isoform of cFLIP (namely cFLIPL), caspase-8 fails to mediate apoptosis, but can cause cleavage of both RIP1 and RIP3, which inhibits necroptosis. By contrast, inhibition of caspase-8 expression or activity by knockout of caspase-8 or its interactor FAS-associated death domain protein (FADD) results in increased RIP1 stability that induces necroptosis. The mixed lineage kinase domain-like protein (MLKL) is the interacting target of RIP3 and a component of necrosome to induce necroptosis (78). The discovery of necrostatin-1 as a RIP1-specific kinase inhibitor enables selective inhibition of necroptosis and underscores its potential contribution to diseases (79). The expression of RIP3 protein is increased in AP. Notably, RIP3 knockout mice exhibit significantly decreased necroptosis and MOF in experimental AP (80,81). These observations suggests that necroptosis mediates AP development. Inhibition of necroptosis by gene deletion of RIP3 or using necrostatin-1 diminishes DAMP release and protects mice from lethal sepsis (82). RIP-mediated necroptosis also is implicated in sterile inflammation from trauma and ischemia-reperfusion injury (79), which is accompanied by high levels of DAMP release. These studies suggest that inhibition of necroptosis blocks DAMP release and prevents sterile inflammation (83). Intriguingly, blocking both apoptosis and necroptosis by combined Z-VAD-FMK and necrostatin-1 treatment exacerbates cerulein-induced AP (84). These data highlight the importance of regulatory switches between different forms of cell death that influence the development of AP. The term pyroptosis was originally coined to describe peculiar bacterial infection-induced death in macrophages (85) and it is now a form of cell death in immune cells mediated by inflammasome in response to immune stimuli (for example, PAMPs and DAMPs) (86). Apart from extracellular ATP, HMGB1 and histone also can induce pyroptosis in immune cells and further augment the infection or sterile inflammation (87,88). For example, RAGE-dependent uptake of HMGB1 by macrophages leads to caspase-1-mediated pyroptosis in the development of inflammation, whereas TLR9 is required for histone-mediated pyroptosis during liver injury (87, 88, 89). Pyroptosis shares morphological features with both apoptosis and necroptosis, including cytoplasmic swelling, DNA fragmentation and pore formation. The formation of pyroptotic DNA fragmentation is independent of caspase-activated DNase. In contrast to apoptosis, pyroptosis has a proinflammatory nature because of the release of cell contents after rapid plasma membrane permeabilization or the secretion of proinflammatory cytokines (for example, IL-1β, IL-18, IL-33 and HMGB1) after caspase-1 activation (86,90). Inflammasome is a multiprotein oligomer that is assembled in the cytoplasm by cytosolic NOD-like receptors (NLRs). A well-studied NLR inflammasome is the NLRP3 inflammasome, which recognizes various agonists. The NLRP3 inflammasome activation requires the priming step, in which DAMPs such as HMGB1 or HMGB1/DNA complex might induce the expression of NLRP3 by signaling through TLR4 and TLR9, respectively (91,92). In addition to NLRs, non-NLR inflammasomes such as absent in melanoma 2 (AIM2) inflammasome have the ability to detect foreign dsDNA. RAGE is required for both HMGB1/DNA complex-induced AIM2 inflammasome activity and autophagy, although upregulated autophagy subsequently limits inflammasome activity (93). The regulatory mechanisms of inflammasome activation are extremely complex (94). Activation of double-stranded RNA-dependent protein kinase (PKR) is implicated in the crosstalk between inflammasomes, DAMP release and cell death (95). TLR9 plays a fundamental role in DNA recognition and activation of innate immunity. Both activation of TLR9 and the NLRP3 inflammasome contribute to pancreatic acinar cell death and sterile inflammation in AP (10). Thus, genetic deletion of NLRP3, caspase-1 and TLR9 in mice protects against cerulein-induced pancreatitis (10). The potential mechanism responsible for these phenomena is involved in increased mitochondrial DNA (mitDNA) and nuclear DNA (nDNA) release during apoptosis, which activates TLR9 as well as NLRP3 inflammasome pathways (10,38,39). Taken together, interplay between pyroptosis and DNA-sensing pathway is involved in the sterile inflammatory response. Why is the immune system so concerned with cell death? The current notion is that DAMPs released or exposed from dying or dead cells contribute to inflammatory and immune responses to remove dead cells and initiate tissue healing (12,13). Failure of this control mechanism can lead to uncontrolled inflammation and serious diseases such as sepsis, arthritis, atherosclerosis, lupus and cancer. By contrast, pathogen-associated molecular patterns (PAMPs) are foreign danger signals and can induce immune cells to actively secrete DAMPs by various nonclassical pathways, which indicates cross-talk between DAMPs and PAMPs in the regulation of innate immune responses (14). A growing number of endogenous substances from multiple subcellular compartments are being identified as potential DAMPs. The most prominent DAMPs are nDAMPs, including HMGB1, histones and nDNA. Other PAMPs include S100 proteins, HSPs, complement, ATP and uric acid. Mitochondria are now recognized not only as central players in cell death but also as an important source of DAMPs. mit-DAMPs, including mitDNA, N-formyl peptides, transcription factor A (TFAM, a mitochondrial HMGB1 homologue) and ROS, play emerging roles in inflammation by the activation of neutrophils, monocytes and macrophages (96). DAMP sensing can be further classified as extracellular or intracellular depending on whether the DAMP is released from the stressed cell. Intracellular DAMP sensing involves detection by intracellular receptors in the same cell that produced the DAMP (14). A number of receptors (for example, TLRs, NLRs, RIG-I-like receptors (RLRs), the receptor for advanced glycation end products [RAGE], and P2X7) have been reported to mediate DAMP activity in different cell types, including immune and nonimmune cells. TLRs play a central role in innate immunity. TLR-1, -2, -4, -5 and -6 are located on the cell surface, whereas TLR-3, -7, -8 and -9 are expressed on the endosomal and lysosomal compartment. NLRs and RLRs act as intracellular surveillance molecules and RAGE is a member of the immunoglobulin gene superfamily. RAGE also is present in the mitochondria and regulates mitochondrial respiration (97). Posttranslational modification (for example, oxidation and proteolysis) of DAMPs affects their receptor binding ability and activity. In addition to receptors, endocytosis also mediates DAMP activity in immune and cancer cells (88,97). A fine-tuned mechanism of these actions in disease needs further exploration. Once released, extracellular DAMPs induce the activation of multiple inflammatory pathways that lead to the production and release of inflammatory cytokines, interferons, chemokines and cell adhesion molecules. Apart from their main effects on immunity, DAMPs and their receptors also have been demonstrated to regulate cell survival, proliferation, differentiation and death in both immune and nonimmune cells. The precise structures and affinities of these lig-and-receptor interactions remain to be fully characterized. HMGB1 is a highly conserved protein with location-dependent functions. In the nucleus, HMGB1 as a DNA chaperone regulates nucleosome structure, genomic stability and a number of DNA-associated events. Loss of HMGB1 in cells increases DNA damage and apoptosis and inhibits autophagy during stress (98,99). Once released during death, HMGB1 acts as a DAMP, regulating the inflammatory and immune responses (100,101). Ample evidence also shows that HMGB1 can act as an intracellular DAMP and drive activation of intracellular receptors through nucleic acid recognition. Caspase-3/7 and PARP-1 are required for HMGB1 release in apoptosis and necrosis, (42),102 respectively), whereas ATG5 and PKR are required for HMGB1 release in autophagy and pyroptosis, (103),104 respectively). RAGE and TLRs are positive receptors mediating the proinflammatory activity of HMGB1, whereas CD24 and TIM3 are negative receptors limiting HMGB1 activity in inflammation and tumor immunity (105). The redox status of HMGB1 also regulates its activity (106). In particular, HMGB1 in reduced all-thiol form promotes cell migration, whereas HMGB1 in disulfide form induces cytokine production (106). By contrast, oxidized HMGB1 loses the above immune activities. Moreover, reduced HMGB1 induces autophagy, whereas oxidized HMGB1 induces caspase-dependent apoptosis (107). However, the redox status within tissue in disease is a dynamic process and the extracellular activity of HMGB1 may change accordingly (108). HMGB1 play an important role in human health and disease (109). The serum levels of HMGB1 are significantly elevated and correlate with the severity of AP (110). HMGB1 seems to act as an important cytokine mediator in the pathogenesis of severe AP and has a wider therapeutic window. Early blockade or delayed therapeutic delivery (for example, ethyl pyruvate , A box  and anti-HMGB1 antibody ) targeting HMGB1 limits development and associated MOF in experimental AP. Antioxidants (for example, pyrrolidine dithiocarbamate 114) and anticoagulants (for example, antithrombin III  and danaparoid sodium ) also inhibit HMGB1 release and therefore protect against injury in AP. By contrast, intracellular HMGB1 protects against AP partly through limiting nDAMP (histones and DNA) release and subsequent inflammatory cell recruitment and activation (11). These observations indicate the dual role of HMGB1 in the regulation of AP. HMGB1 function is not only complicated in the pancreas, but also in other tissues/cells according to studies of HMGB1 knockout or knockin mice (117). HSPs are conserved stress proteins and their expression is upregulated in activated cells responding to heat shock, infection, hypoxia and other stressors. The major function of HSP is assisting with the folding and unfolding of newly translated proteins during stress. According to their molecular size, mammalian HSPs are categorized into the following groups: HSP100, HSP90, HSP70, HSP60, HSP40 and the small HSPs (for example, HSP25/27, αB-crystallin and HSP22). Overexpression of intracellular HSPs inhibits apoptosis and inflammatory cytokine production (for example, TNF-α, IL-1β and HMGB1) following cellular stresses. HSP70 is directly involved in chaperone-mediated autophagy (118). HSP70 and HSP27 confer protection in cellular stress by enhancing autophagy and mitophagy (119,120). Some HSPs such as HSP70 and HSP60 are rapidly released following nonprogrammed cell death (12,13). Extracellular HSPs induce immune cell activation and the proinflammatory response through binding to PRRs, including TLR2, TLR4 and CD91. Due to their molecular chaperone properties, HSPs easily complex with other molecules including PAMPs; several studies demonstrate that the previously reported cytokine activity of HSP was due to contaminating bacterial products including LPS and flagellin (121,122). This supports the argument against the role of HSPs as DAMPs. The expression of inducible HSPs (for example, HSP27, HSP60, HSP70 and HSP90) is upregulated in experimental AP (123,124). Preconditioning of animals with either a thermal or chemical stressor induces HSP expression, which in turn protects against AP (56,57). Knockout of heat shock factor protein 1 in mice inhibits HSP synthesis and develops more severe AP induced by cerulein (125). HSP27, HSP60 and HSP70 are direct effectors in mediating this protective effect against AP by regulation of NF-κB signaling (30), intrapancreatic trypsinogen activation (56,126), calcium overload (125), actin cytoskeleton (127), apoptosis (128) and autophagy (129). Although studies of the role of extracellular HSP in AP are limited, one study shows that administration of recombinant HSP70 in mice aggravates cerulein-induced AP in a TLR4-dependent manner (130). Serum HSP27 is increased in patients with pancreatitis and pancreatic cancer (131), highlighting its role as a potential biomarker in these diseases. DNA is the hereditary material that carries genetic information. According to the endosymbiotic theory, nDNA and mtDNA have separate evolutionary origins. mtDNA evolved from the circular genomes of bacteria when an early eukaryotic cell engulfed a prokaryotic cell (132). DNA is a potent activator of innate immunity by activation of type I interferon, inflammasome, and NF-κB pathways (133). Monitoring levels of circulating DNA has been proposed as a useful tool in the noninvasive diagnosis of human diseases. Serum DNA level is elevated significantly in patients with severe AP and may be an early predictor of severity in AP (134, 135, 136, 137). Apoptotic or necrotic cells are the primary source of circulating DNA during AP. Different types of nucleic acid receptors and sensing molecules have been identified (133). TLR9 is critical for the recognition of CpG DNA. The expression of TLR9 in the pancreas is increased in AP (138) and genetic deletion of TLR9 protects mice from AP (10). TLR9 also mediates the innate immune response to nDNA, mitDNA, histone and HMGB1 in AP and other sterile injuries (10,89). The interaction between RAGE and TLR9 is required for HMGB1-nDNA complex and TFAM-mitDNA complex-mediated immune responses (139,140). RAGE also has the ability to directly recognize DNA (141). A study indicates that besides RAGE and TLR9, TLR2 is required for the HMGB1-nucleosome complex-mediated immune response in macrophages and dendritic cells (142). These findings improve our understanding of how DNA-protein complexes trigger innate immune responses in human diseases, including AP. Histones are basic components of chromosome structural units, namely nucleosomes. They are divided into core histones (H2A, H2B, H3 and H4) and link histones (H1/H5). In the nucleus, histones and their posttranslational modifications regulate chromosome structure and function (143). In addition to their nuclear function, emerging studies indicate that histones as well as nucleosomes can be released into the extracellular space upon infection (for example, sepsis) (144), sterile inflammation (for example, trauma, ischemia-reperfusion injury and pancreatitis) (11,89,145) and death (for example, apoptosis, necrosis and NETosis) (146). NETosis is a unique form of cell death that is first observed in neutrophils upon microbial infection (147). Neutrophils have the ability to release chromosomal components including histones to capture and kill microbes (147). Once released, histones exhibit DAMP activity with significant induction of proinflammatory and toxic responses in vivo and in vitro (144,145). Activation of TLRs (for example, TLR2, TLR4 and TLR9) and NLRP3 inflammasome mediate the activity of histones (87,89,145,148). 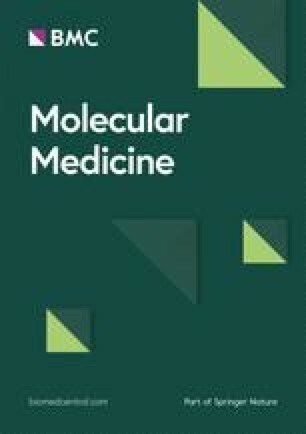 Dynamic changes in circulating levels of histones as well as nucleosomes serve as potential biomarkers and novel therapeutic targets in human diseases (149,150). Our recent study indicates that oxidative stress-mediated DNA damage is responsible for histone release in AP (11). This process is controlled by intracellular HMGB1 (Figure 4). Loss of intracellular HMGB1 in pancreatic tissue leads to local oxidative injury, which facilitates nuclear catastrophe and proinflammatory nucleosomal (histone and DNA) release (11). Consistently, antioxidant N-acetyl-L-cysteine protects against AP in pancreatic HMGB1 conditional knockout mice (termed CH mice). Once released, extracellular histones (H3 and H4) can recruit and activate immune cells such as macrophages to secrete HMGB1 into the circulation of CH mice. Moreover, anti-H3 antibody and anti-HMGB1 antibody protect against AP in CH mice (11). These findings suggest interplay between intracellular and extracellular nDAMPs in the pathogenesis of AP (see Figure 4). Role of intracellular and extracellular HMGB1 in acute pancreatitis. Under normal conditions, HMGB1 is located in the nucleus of pancreatic acinar cells to regulate nucleosome stability. However, under conditions of increased pathologic insult, increased oxidative stress and calcium overload leads to HMGB1 release. 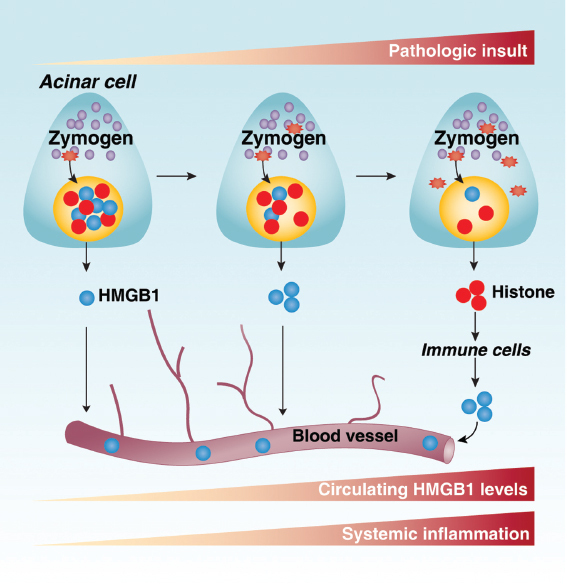 Loss of intracellular HMGB1 in pancreatic acinar cells accelerates DNA damage, cell death and nDAMP (for example, histone) release. Subsequently, extracellular histone promotes immune cell (for example, macrophage and neutrophil) recruitment and activation, which leads to HMGB1 release. Consequently, circulating HMGB1 levels are increased and function as a mediator of lethal systemic inflammation in acute pancreatitis. ATP, the major energy currency molecule of various cellular processes, is normally present in the cell cytoplasm and is used as a substrate for protein kinase activation (151). Most ATP in mammalian cells is generated within the mitochondria. The ability of autophagy to defend cells against various stressors is obtained partly through the generation of substrates to maintain ATP production. Intracellular ATP levels determine cell death fate (33). ATP depletion leads to necrosis, whereas ATP production is required for the induction of apoptosis (33). Further, ATP can be passively released into the extracellular space during cell death, which mediates the immune response by P2X7 receptor (152). Several mechanisms have been reported to regulate passive ATP release. For example, caspase and pannexin 1 regulate ATP release in apoptosis (153). In addition, active secretion of ATP has been identified in immune and cancer cells. The underlying mechanisms of ATP secretion include ion channel-mediated conductive release as well as autophagy-mediated exocytosis of ATP-enriched vesicles (154, 155, 156). Extracellular ATP regulates multiple cell processes, including cell migration, metabolism, inflammation, immunity, differentiation, apoptosis and autophagy (151). However, the signaling mechanism of these ATP-mediated activities remains to be elucidated. In AP, extracellular ATP binds to its receptor P2X7 and results in NLRP3 inflammasome assembly, caspase-1 activation and IL-1β secretion (10). Inhibition of P2X7 through genetic deletion, or treatment with P2X7 antagonists (for example, A-438079), limits pancreatic injury and the inflammatory response in an experimental animal AP model (10). In another study, mitochondria-mediated intracellular ATP depletion was found to be able to cause necrosis in AP (157). Interestingly, the P2X7 receptor not only mediates extracellular ATP activity, but also regulates ATP release in several cells (158). Thus, it seems likely that the ATP-P2X7 signaling pathway is a novel regulating mechanism for AP. It has been widely accepted that inflammation and cell death are key pathologic responses of AP and determine disease severity. Mitochondria-mediated cell death is essential for the initiation of AP. As mentioned above, imbalanced production of mitochondrial calcium, ATP and ROS are the most common causes of cellular injury and death. Various signaling molecules and proteins have related or overlapping actions in the regulation of cell death. This regulation not only modifies the magnitude of the death response but also results in switching between different types of death. Such complex death events then progress to a systemic inflammatory response that is mediated by the release of various intracellular content including DAMPs. DAMPs are not only passively released during cell death and tissue injury, but also actively secreted by activated immune cells. DAMPs have multiple forms and their activities vary greatly depending on type of death, posttranslational modification, and their receptors. In particular, HMGB1, one of the best-characterized DAMPs, has a unique role in AP according to experimental and clinical studies. It is also worth mentioning that intracellular and extracellular DAMPs may have different mechanisms of action in the pathogenesis of AP (see Figure 4). Intracellular DAMPs such as HSP and HMGB1 inhibit cell death and the inflammatory response during AP development. Extracellular DAMPs may exert synergistic effects to accelerate the development of AP. The role of DAMP receptors such as TLR2 and TLR4 in AP appears complex and even contradictory (159, 160, 161). The existence of multiple DAMP receptors likely provides distinct control mechanisms for expanding or diminishing inflammation at different stages of AP. Metabolic changes such as aerobic glycolysis in cells participate in the inflammatory response contributing to HMGB1 release in sepsis (162), although this change in AP remains unknown. Future studies are needed to confirm this concept and define in detail DAMP release, biological activity, receptor signal transduction and cross-talk between different DAMPs and their receptors in patients with AP. This area of pathobiology offers great opportunities to define novel biomarkers for disease progression as well as targeted therapies to redirect the aggressive local and systemic inflammatory response that characterizes severe forms of AP. We apologize to the researchers who were not referenced due to space limitations. We thank Christine Heiner (Department of Surgery, University of Pittsburgh, Pittsburgh, PA, USA) for her critical reading of the manuscript. This work was supported by the National Institutes of Health (R01CA160417 to D Tang; R01CA181450 to HJ Zeh/MT Lotze) and a 2013 Pancreatic Cancer Action Network-AACR Career Development Award (grant number 13-20-25-TANG). The work supporting the findings reviewed in this manuscript was aided by core support from the University of Pittsburgh Cancer Institute (NIH grant P30CA047904).